Movie ‘Thelma’ was released in September 15, 2017 in genre Romance. Joachim Trier was directed this movie and starring by Eili Harboe. This movie tell story about A college student starts to experience extreme seizures while studying at a university in Oslo, Norway. She soon learns that the violent episodes are a symptom of inexplicable, and often dangerous, supernatural abilities. Eurimages, Motlys, Le Pacte, Film i Väst, Nordic Film och TV Fund, Norwegian Film Institute, Snowglobe Films. Oh, what a wonderful post and lucky you, Ms. Interpreted! And I’m in love with the story about you and Stephen discussing Paul DInello’s ripped bod! That is hysterical, and will almost certainly have me snickering for a long time to come. Wish I’d met you at the Mockingbrd event. I was there, and was quite sure other Zoners/Completists were, but I didn’t know anyone at the time, really, and believe it or not, I am really so shy that I didn’t ask. (No, most people don’t think I’m shy, but it’s true. That’s why I chose not to full-time teach.) If memory serves me right, I also remember that when you wrote about where you were sitting, it also was very near my seat. Strangers in the night…. I wish you the best of luck, and I also wish you some sanity in your life. I know you’ve been so busy working and traveling, which I’m sure is exciting. But still, sometimes a little time to settle is a good thing. Take care and hope to see you sometime at a Colbertian event. You take care, too, and who knows? We may yet meet at one of these things. Take care. You have nothing but my best wishes. Aww, thanks. You take care, too. Ms I- Those are great stories! I have missed seeing you around here- not that I have been as active in the past year as I have been in the past. Ah, life! I want to thank you, a while back, we had a discussion in a thread (may have been two years ago now) about books and you suggested several. I picked up a Sarah Vowell book based on our conversation and I think of you and NFZ everytime I see it on my shelf. Best of luck to you! Hope to see you around the interwebs! Nope- it was perfect and I have since recommended it to others! You really took the time to find my likes and interests. Thanks again and I hope your job calms down soon! Best of luck to you! What a great story… How wonderful to hear it affirmed yet again what a gracious, open and caring person Stephen is. Thanks so much for sharing! Amazing, MsI, just amazing … best wishes to you and safe travels … hope to catch you around! Great post! Thanks for sharing your stories, and thanks for all of the work you’ve put into the site! Hope to catch you down the road! Thank you, Ms Interpreted for all the great stories and articles you shared here on NFZ and thank you for sharing in this beautiful letter your experience and memorable TCR moments with us. I hope this is only a temporary good bye. 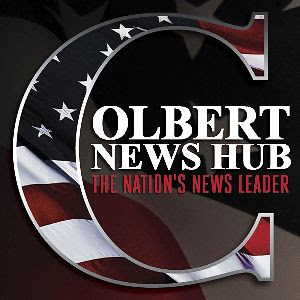 Looking forward to read more of your wonderful posts on the new NO FACT ZONE section of Colbert Nation. All the best to you! I’m gonna miss nfz soo much!! That was a truly great story to read, MsI. I always love reading other people’s stories about meeting Stephen, and yours was no exception. I especially love that he pointed to you in the audience at the taping you attended; it’s cool that he remembered you (it’s also cool that the remembrance was from a DonorsChoose event). And the thought of him sitting at his desk, playing with his LOtR action figures in a suit and tie makes me smile. Thank you for everything! I cannot say that enough. Thanks! Those toys were adorable. I had so much fun re-watching this episode when I was trying to figure out what to post; the elephant vasectomies bit was great! Especially since I was just in Kenya last year; the eles there were so impressive, and there really were a lot of them in the park near Kilimanjaro where I was. Not that I’m advocating the vasectomies, you understand, those creatures still face unbelievable threats. (I even adopted a baby elephant from Sheldrick’s Elephant Orphanage; she’s a sweet thing that sucked my fingers into her mouth and plays soccer by the mud wallow where the visitors are allowed to watch the ele orphans for an hour a day.) But that segment was hilarious. That’s a wonderful and funny story, Ms. Interpreted! I hope to be as lucky as you and every other Zoner someday in being able to attend Colbertian events and to actually meet and talk to Stephen himself (hopefully multiple times!! ), although, like leorabk, I’d probably be either too shy to even approach Stephen (mostly due to lack of confidence and feeling that maybe I don’t deserve to meet him), or if I’m ever in close proximity to him, my body will probably let me down by unleashing an anxiety attack (convulsions, stuttering, the works) and make me end up looking like a fool in front of him (it’s happened when I’m under immense stress on the spur of the moment). We’ll see. Thanks for everything that you have done for NFZ, Ms. Interpreted! Thanks, y’all. It’s been fun. And to those of you who haven’t met him yet, I wish you luck (assuming you’re not stalkers, that is). ;) It’s a surreal, exciting, memorable, and thoroughly enjoyable experience, and he and his staff are wonderful people. I won’t pretend it’s not a giddily nerve-wracking thing, but once you get used to the feeling that your internal organs are swing dancing — or maybe having a Chinese fire drill! — you realize that you’re just having a lovely time, standing there talking to a person with a big, kind, gentlemanly heart. Oh I can attest to everything you just said….that’s exactly what it felt like for me. I know I’ve seen that story about you and Stephen talking about Paul’s hot bod before — can’t remember if it was in another post somewhere or in an email — but I will never get tired of it. It’s too funny! One of the best parts of being in this fandom has been to be in Stephen’s presence. I’ve been to numerous tapings and several live appearances where I had the opportunity to talk to him, however briefly. He truly is a kind gentleman with a generous heart. And when you’re in that studio for a taping, the joy that radiates off him is contagious. I leave those tapings feeling like I’m walking three feet off the ground. I’ve loved reading your commentary on TCR for years, not just here but also at the TWoP boards back when we both had time for that. One of the best things about being part of the NFZ family has been making friends who share the same passion for Stephen and his work. I do hope you’ll keep in touch, when you have the time!